​Medicare Supplement plans (also called Medigap) are private health insurance plans designed to supplement Original Medicare (Parts A & B). Original Medicare pays for much of the costs of covered health care services and supplies but what is left over is your responsibility to pay. Medigap policies fill these "gaps" in coverage and may significantly reduce, and in some cases, eliminate this financial exposure, depending on the plan you select. You must have both Medicare parts A and B to get a Medigap policy. ​You may not buy a Medigap plan if you have a Medicare Advantage Plan (Part C). You may buy a separate Prescription Drug Plan (Part D) if you have a Medigap policy. Part A coinsurance for hospital stays days 91-150 is $682.00 per day. Medicare Supplement insurance companies are regulated by both federal and state laws. Medigap plans are identified by letters and plans are standardized (with the exception of MA, MN, and WI, which offer different standardized plans). Each plan must offer the same basic benefits no matter which insurance company offers it. For example, all Plans N are the same in coverage. Some plans have more benefits than others. So what makes them different? Rates and rate stability, underwriting criteria, customer service and the financial strength of the insurance company. Why do Medicare Beneficiaries want a Medigap policy? 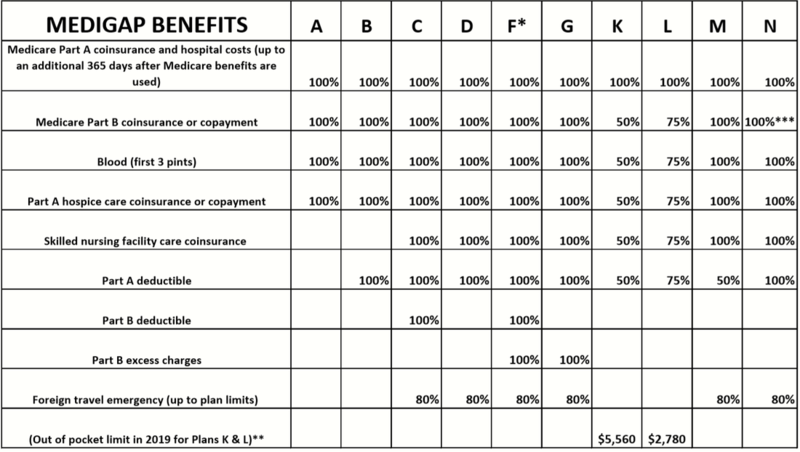 The chart shows basic info about the different benefits that Medigap policies cover in 2019. The percentage indicates how much of the benefit is covered. The policy holder is responsible for the rest. A blank means there is no coverage for a benefit. *Plan F is also offered as a high-deductible plan by some insurance companies in some states. If you choose this plan this means you must pay for Medicare-covered costs up to the deductible amount of $2300.00 before your Medigap plans pays anything. ** For Plans K and L, after you meet your out of pocket yearly limit and your yearly part B deductible ($185.00) the Medigap plan pays 100% of covered services for the rest of the calendar year. *** Plan N pays 100% of the Part B coinsurance except for a co-payment of up to $20.00 for some office visits and up to a $50.00 co-payment for emergency room visits that don't result in an inpatient admission. Medicare Advantage plans are another way you may get your Medicare benefits. Also called Medicare Part C, it's an alternative to Original Medicare (Parts A and B) but you still must be enrolled in both Part A and Part B to to get Part C. Unlike Original Medicare, these plans are administered through private insurance companies. These plans are similar to private health insurance plans in that plans vary in coverage and rules so you'll want to compare them carefully. You may have cost sharing through deductibles and coinsurance. Deductibles could be high but these plans do have a yearly limit on total out-of-pocket expenses. In many cases these plans offer broader coverage than Original Medicare because they may combine Part D (a Prescription Drug Plan) with Parts A and B, and many offer coverage for routine vision, dental, and hearing services that aren’t available under Original Medicare. Depending on what is available in your area, plans could offer HMO or PPO networks. Plans may change each year and coverage areas may be limited.